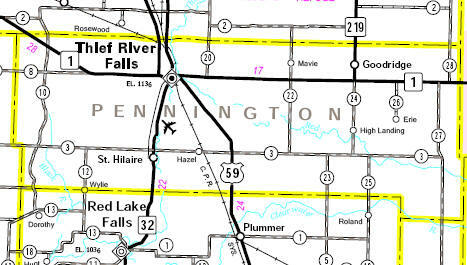 South of Marshall County on U.S. Highway 59 is Pennington County (pop. 13,930); it was separated from neighboring Red Lake County in 1910. The county seat is Thief River Falls (pop. 8,573). The former Soo Line Depot in Thief River Falls, built in the American Craftsman style in 1913, was an important station on the main line between Minneapolis and Winnipeg. It once had 13 passenger trains a day; passenger service ended in 1967. The Carnegie Library (1914) in Thief River Falls has been restored as a community center. Author Gary Paulsen, who spent his early teen years in Thief River Falls, has written about how the librarian at the Carnegie Library inspired him to be an enthusiastic reader. Gary Paulsen has written more than 200 books. Thief River Falls has its own River Walk along the Lake and Thief rivers. The Thief River flows into the Red Lake River, which flows into the Red River, which flows into Lake Winnipeg and eventually into Hudson Bay. TRF native Ralph Engelstad donated $13.5 million for an arena for the high school ice hockey team. There’s a larger Ralph Engelstad Arena at the University of North Dakota. The Peder Engelstad Pioneer Village has a museum and 19 historic buildings. Seven Clans Casino, owned by the Red Lake Nation, is southeast of town. This entry was posted in Minnesota and tagged Gary Paulsen, Pennington County, Ralph Engelstad, Seven Clans Casino, Thief River Falls. When I was in junior high school a new boy came into our classroom from “T’eif River Falls.” I’m in touch with him today — 72 years later — will let him know of this report. Thief River Falls is an awesome town name.